What would vegan Mexican cuisine taste? No meat is easy to imagine as you can end up with cheese enchiladas or mushroom tacos, but how do you make an entire menu without cheese? Vegan versus vegetarian can be so different. With its vegan menu, crafted by Chef Chandra Gilbert, Gracias Madre succeeded to offer a delicious meal and when a carnivore like me is excited by the experience, it probably tells you something. We went there for our last night in LA, to meet Jodi’s high school friend...Jodi. At least I had no problem remembering her name...The place, located on Melrose Avenue was huge with an outdoor area that was as big as the dining room, and packed. It is definitely a trendy restaurant that fits the Californian way of eating. I started my meal with a margarita that was pretty good, perfectly made. Jodi got a vanilla lime soda that was refreshing. 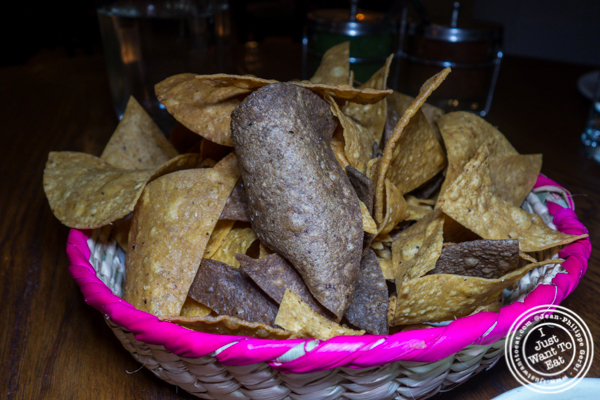 We then shared the guacamole, served with homemade corn tortilla. The guacamole was very good, well seasoned and mild, with chunks of avocado. 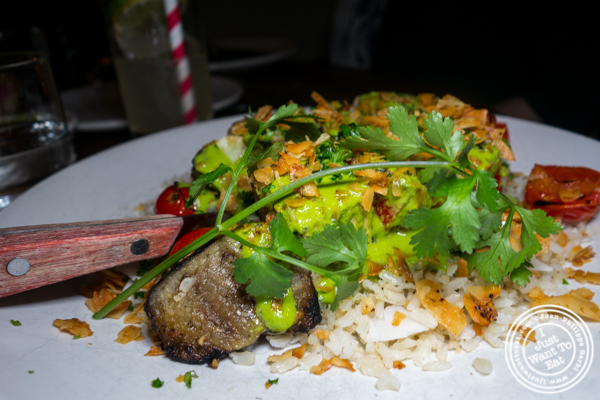 For her entree, Jodi ordered the grilled tofu accompanied with coconut rice, chermoula, eggplant and red pepper. It was good, but I admit that it was not as good as my dish that was succulent. 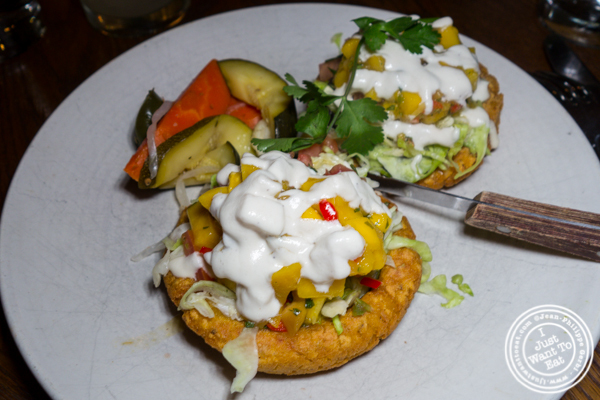 It was the sopes con mango, potato-masa cakes topped with mango, habanero salsa, black beans, cashew cream and escabeche. 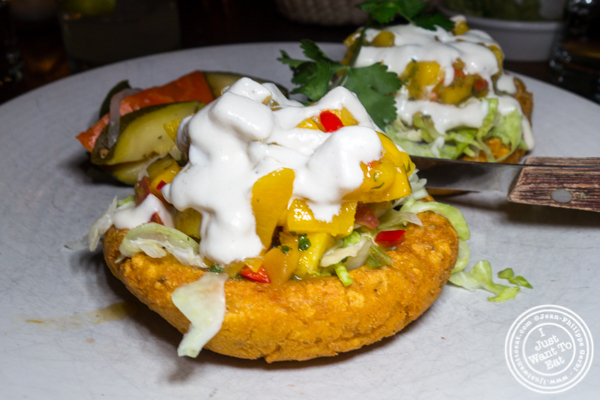 I simply loved it: comforting, the potato-masa cakes were slightly crispy and tasted like potato pancakes. It was superb with the various ingredients on top of it, especially the mango that was ripe and added a nice sweetness to the dish. 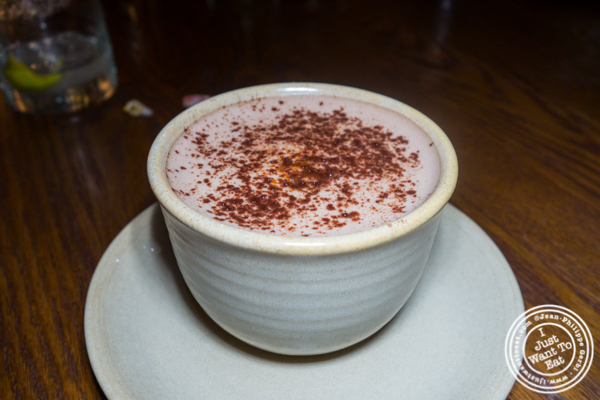 We were so full (we also had a late lunch) that we skipped dessert and settled for a Mexican hot chocolate that was good, with nice spices in it. We had a great meal at Garcias Madre: the food was very good and I did not feel like I was missing meat and even forgot I was in a vegan restaurant. I would not only go back, but also recommend it!